They both pave the way for new VR experiences. Virtual reality has plenty of hurdles to surpass before it reaches mainstream acceptance, among them is the need to be tethered to a computer for high-quality VR. So it's no surprise that wireless VR tracking is a big focus for the HTC Vive this year. And on top of that, the Vive Tracker will also let developers easily bring just about anything into VR worlds. We had a chance to test out both new devices at CES this year, and while they're in fairly early stages, it's clear they'll fundamentally change the VR landscape this year. I tried out TPCast's Vive wireless adapter, which will be available globally in the second quarter of this year for $249, and came away mostly impressed. It's a small device that attaches to the top of the Vive's headset and completely replaces the need for the Vive's clunky umbilical cord. While you can use the TPCast's adapter completely wirelessly for about an hour and a half, I tested it with a large battery pack that had to sit in my back pocket. And yes, that meant I had a cable once again, but it still provided more freedom than the typical Vive setup. I didn't have any synchronization or delay issues while wearing the TPCast adapter, even as I tried to move my head around a lot. Together with a large gun accessory (which had the Vive Tracker attached), I was able to move around a decently sized space, shoot baddies and dodge bullets. While the gun had some synchronization issues (remember, these are all early demos), I was surprised by how well the head tracking worked. I expected some nausea-inducing stuttering, but it was all as smooth as the tethered Vive experience. 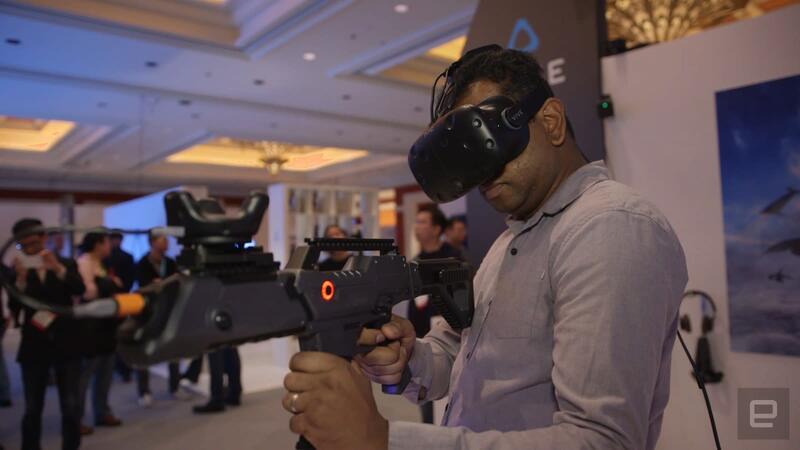 In a mixed-reality demo for First Contact's Rom, the Vive Tracker was also attached to a hefty gun, which did a decent job of following my movements as I ducked behind virtual barricades. From my perspective, it was a fairly straightforward shooter, but observers were able to see how I was moving around the virtual space from external monitors. At this point, expect plenty of developers to slap the Tracker on gun accessories. It's a lot easier than attaching a full-sized Vive controller, which was how many companies previously handled virtual tracking. The Vive Deluxe Audio Strap, which I wore during that demo, was also surprisingly comfortable. It makes it easier to slip on and tighten the Vive to your noggin. The strap also moves much of the Vive's weight to the back of your head, which was a big help for me (I've always felt it was way too front-heavy). The built-in headphones sound great, and they're a lot easier to manage than a standalone pair of cans. You can also expect the Vive Tracker to lead to all sorts of new ways to interact with VR worlds. 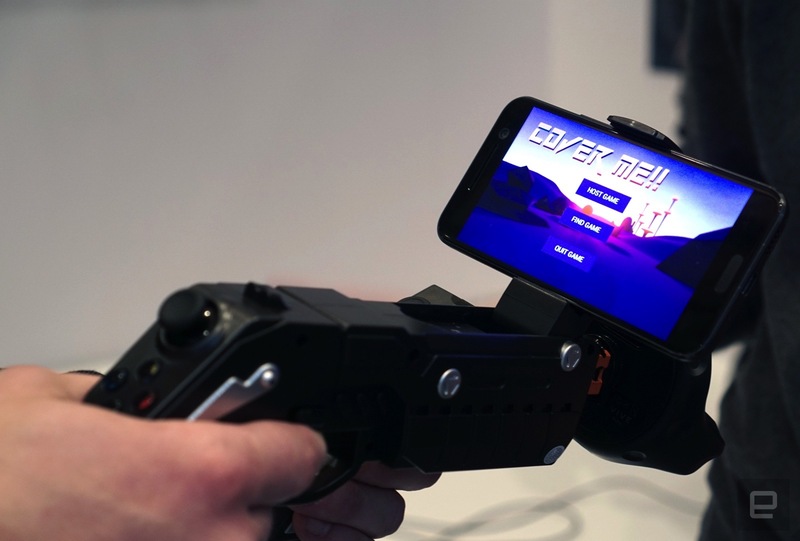 Master of Shapes, who developed the Castrol Virtual Drift experience last year, is using it to let people use their smartphones to join in with their friends' VR gaming. You can actually see the VR environment through your smartphone, which allows you to quickly team up with your buddies. It looks ridiculous, but it's also a wonderfully unique (and necessary) way to extend VR experiences out of the headset. 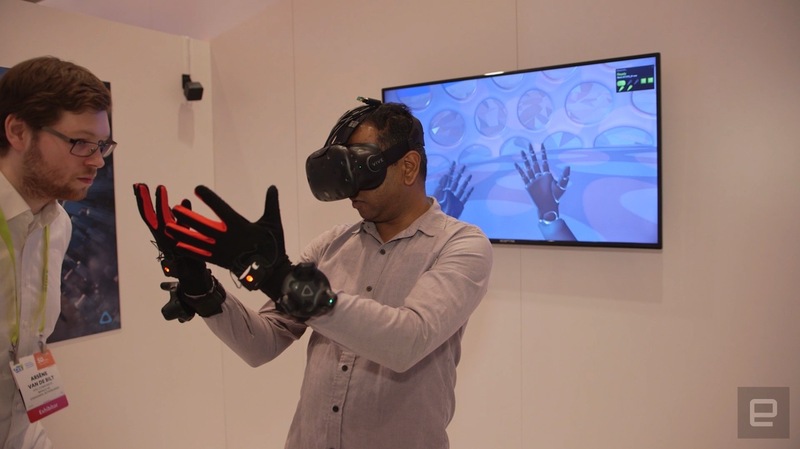 The Vive Tracker isn't just useful for guns either: Manus is using them together with a pair of their prototype gloves to accurate track your finger and arm movements. We've seen finger tracking before, but the ability to track the articulation of your arms and elbows seems unique. The tracking data their gear collects could be used to analyze athlete performance and handle virtual objects (something enterprises are increasingly interested in).